Petite Blythe "Miss Sally Rice"
The Neo Blythe wore a red dress and had light blue hair to create a unique and cute style, and this Petite Blythe is coordinated with soft colors to match her fuchsia pink hat. 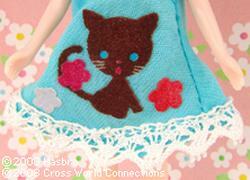 Her dress is light blue, and has a brown cat print on it. Her fuchsia pink beret is a pop accent to the look. The white lace on the dress also adds a sweet, innocent look. 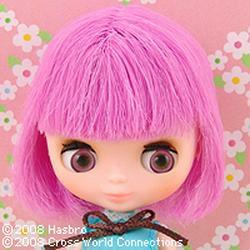 She has a light purple bob hair. Her brownish pink eyes, peach lips remind us colorful candies. Neo and Petite Miss Sally Rice make the perfect pair! 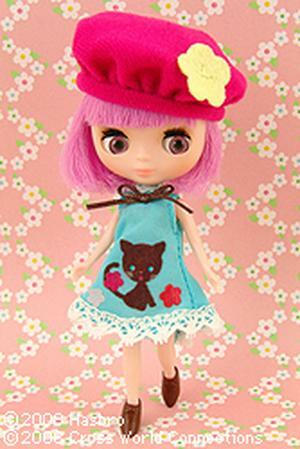 [ Skin Type ] Fair *Petite Blythe does NOT have a semi matte skin like Neo.